In this top most section I’d look to go over the Bridge Protocol Data Unit (BPDU) which is the building block of spanning-tree. Let’s go in-depth on the headers, their values, and their differences in version iterations. You should utilize my anki notes that I provide to memorize all of the important fields. I know it may seem like a lot, but in reality it only took me 15 minutes to memorize these. Here is the BPDU for classic spanning-tree and PVST+. Message Age: Sent as 0 by the root bridge, incremented once every time a non-root switch processes this and resends it. The BPDU will age out if MAX Age – Message Age = 0. 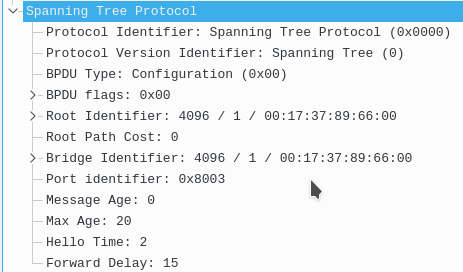 Max Age: Similar to a hold timer, reset every time a port receives a BPDU. The message age is subtracted from this such that if we receive a BPDU with a message age of 3 our max age for the BPDU will be 17 (due to a 20 sec default max age). Forward Delay: This is the value that each phase, Listening and Learning spend.